source - "The Christian Solution"
Charlemagne, father of France and Germany, along with his Franks created the Holy Roman Empire on Christmas day, 800 AD. He hoped to revive the Roman Empire in the West and staunchly defended the Pope against the Muslim Saracens from Moorish Spain who were attacking the Vatican itself. At its height, the Holy Roman Empire would stretch from the icy Baltic to the Mediterranean coast of Italy, dividing Europe East to West. As a staunch defender of the Pope, against their allies the Judeo-Muslim Moors, one would expect the Holy Roman Empire to be a prime target of the Jewish Sanhedrin. An already mentioned womb was the initiation of the Protestant Revolution in the Holy Roman Province of Saxony with Martin Luther. Over the next hundred years, Protestants would extend their gains with a considerable foothold. Now was the time to strike a fatal blow. One hundred years after Martin Luther, in 1617 AD, Ferdinand II was elected King of Bohemia by the Bohemian Diet. A strict Catholic in an overwhelmingly Protestant Bohemia, King Ferdinand was overthrown. Thus, the Bohemian Revolt in 1618 would mark the beginning of the Thirty Year War. Not to disappear in history, Ferdinand II succeeded to the throne of the Holy Roman Empire in 1619, with the backing of the Catholic League of Poland, Spain and Bavaria. The Holy Roman Empire had been their long time enemies of their protectors, the Judeo-Saracens of Andalusia Spain. Their new Christian ally Spain was the very country that had expelled them out of Spain. This was too much to resist. The Sanhedrin employed the full resources of the trading gossip network and soon, one by one, all of Europe was fighting this European-only Religious World War. Based largely upon Catholics and Protestant camps, Cardinal Richelieu would be an exception, bringing France in on the side of the Protestants. Having Cardinal Richelieu, as a Herodian, was a major plum for the Pharisees. Get this -- Richelieu was convinced that Catholic Spain on one side aligned with the Catholic Holy Roman Empire on the other was a threat to Catholic France in the middle. And Frenchmen would believe this absolutely silly story of his, of course , only after the Jewish media-Scribes had juiced the story up a bit. So Catholic France was convinced to side with their enemies, the Protestants. Imagine if Catholic Frenchmen would be told later that Protestant English would become Catholic Frenchmen's worst nightmare. Likewise, the Catholic French would help the Ottoman Turks attack and weaken the Austrian Hapsburgs from the East. I'm not kidding! -- Pure Pharisee media-Scribe propaganda written all over it. Cardinal Richelieu is an interesting character. If ever there were a need for a Catholic Reformation, this so-called Cardinal of the Catholic Church would have been a good start to needing purged. While he did fight the French Protestant Huguenots within his country, he became the father of the modern nation-state by centralizing power along language, ethics and culture and became the first Prime Minister of any country. The Peace of Westphalia signed in 1648, marked the end of the Thirty-years war. Germany's population was reduced by 30%, while 50% of the territory of Brandenburg was destroyed and some areas suffered with an estimated two thirds of the population having died. Half of all German males were dead. For helping the Sanhedrin give the mortal blow to Hitler's "First Reich" of Germany, causing the Holy Roman Empire to wither away, until Napoleon finally kills it in 1817, the French would be rewarded by the coming reign of King Louis XIV, the Sun King, as the premier ruler of Europe. We shall see that the Pharisees are fickle friends as the Judeo-Protestants of Holland and the Sun King nearly bankrupt each other, paving the way for the anti-God, but somehow pro-Jewish, French Revolution that deposes King Louis the XVI. The boots got a lot snugger with that pull. With the Judeo-Protestant Revolution successfully off and running, now came the time for the beginning of the end of Kings. The Protestant Kings had made themselves the countries "Pope" in matters of religion and morals and they became thoughroughly corrupted as a result. The Pharisees never "let a crisis go to waste". Now, the authority of Protestant Caesar-Pope kings came into question. The Pharisees created the problem and of course, they also had the answer. The Masses were again riled up to create parliaments, which promised to limit the Caesar-Pope life-death power of the King. Parliaments were now said to have partial authority next to Kings. The English Civil War, based deeply on religious differences, pitted the "Royalist" or "Cavaliers" of the Judeo-Protestant Caesar-Pope King of England against the "Parliamentarians" or "Roundheads" of the Protestant English Parliament "masses" with King Charles I, son of James 1, being beheaded in 1649 over it. Now, ordinarily, the beheading of a King by the masses would be a big event with the other Kings of Europe. It would be a tremendous deal if Catholic Kings saw another Catholic King beheaded, but this Protestant King had set himself up as Pope and had abused the "Divine Right of Kings" authority given to him by God and so he had it coming to him. My, my, are Pharisees masters of divide and conquer!!!!! With Europe being the mist of the Thirty Years War, the English Pharisees were not the least worried that a "Catholic" King of France or Spain would react much to the beheading of a "Judeo-Protestant" "Caesar-Pope" King of England, even if the Judeo-Protestant Casear-Pope King was suspected by a media-scribe induced Parliament "mob" of being tolerant toward Catholics. The media-scribes were once again working Judeo-Protestants up into frenzy. 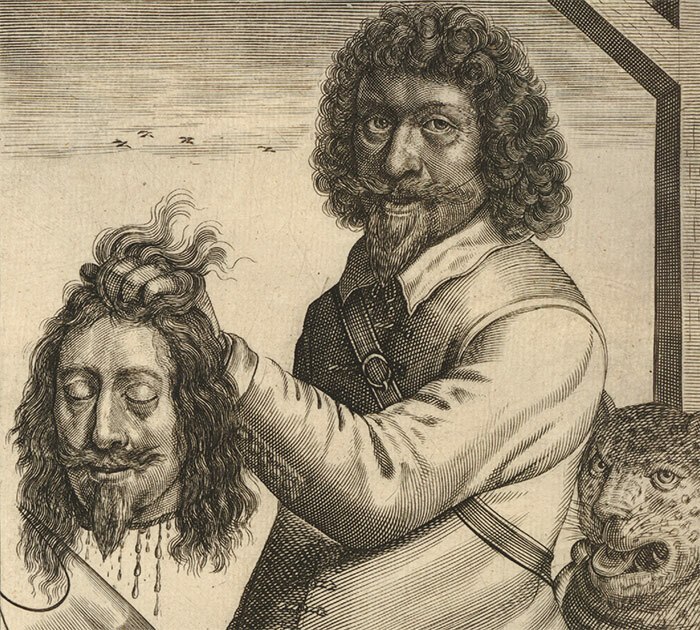 The aftermath of the beheading of King Charles I resulted in the unabashed Judeo-Protestant Oliver Cromwell as Lord Protector. Cromwell rejected the title of King, but in fact, he was more of a tyrant than King Charles ever was. King Charles II returned in 1660 after Cromwell died. As an interesting aside, the Virginia colony remained loyal to King Charles I, the son of their founder James I, who founded Jamestown in 1607, and as a result, Virginia became nicknamed "The Old Dominion". The important thing for us to remember about Puritan Leader Oliver Cromwell was that he had a fervent un-Christian-like hatred of his fellow Christians, the Roman Catholics. Cromwell recognized the Jews in England in 1656, the first time in over 350 years that NT Jews were openly recognized. Catholics had banned Jews; Protestant Christians despise Catholic Christians, but embrace Jews. You figure it out! Can't have anything to do with that "Chosen People" propaganda the Jewish media-Scribe Jesus-Deniers keep hitting us with could it? Actually, historians say that Herodian Cromwell did this embrace of Jews for economic reasons. He was trying to lure the rich NT Jews from Amsterdam to help England prosper economically.
] The English Herodian lawyers were all for Cromwell's toleration toward the NT Jews, but not the rank and file Judeo-Protestant, nor the merchants who knew they were about to lose their livelihood to successful NT Jewish traders. Seems that the rank and file Protestants saw through the hypocrisy of Cromwell. How could Cromwell be so religiously fervent as to be rabidly intolerant of anything Catholic, while at the same time, was so greedy as to get in bed with Jesus-deniers in a sell your soul to the devil deal, just so that England could get filthy rich? Virtual NT Jewish takeover of England with "The Glorious Revolution"
Eventually, the son of the decapitated Charles I, or James II became King of England. The sin of King James II, of course, was that he was Catholic. The Herodian media-scribes in England, headed by William of Orange's homosexual lover Hans William Bentinck, commenced an intense propaganda campaign. In short order, the media-scribes had Catholic James II disposed by Judeo-Protestant standard-bearer William of Orange. At the insistence of England's Protestants through their media scribe mouthpieces, William and Mary from the Netherlands organized an invasion force 4 times larger than the Spanish Armada and commenced the so-called "Glorious Revolution" of 1688. James II ran away without a fight. Bootstrap tightened once more as William of Orange funded the invasion of England with 2,000,000 Guldens from Sadducee Antonio Lopez Suasso and later from Sadducee Baron Avernes de Gras. The Coup was complete. Herodian William of Orange was now ruler of both Judeo-England and the Judeo-Netherlands. The reason why we can call William of Orange a Herodian is not that he used Sadducee money to fund his Glorious Revolution. Many Kings had bankrupted their country in many wars using Sadducee money that was arming both sides. That much happened too many times. What William did was particularly noteworthy. After the Protestant Dutch helped England in their Glorious Revolution and after the Dutch had provided shelter for the NT Jews for so long in Amsterdam, the Dutch Protestants finally got the shaft themselves. William used Dutch money, not English money, to fight a series of long debilitating battles with the Catholic Sun King of France's Louis XIV. The Netherlands was left with high national debt, high taxes, European hatred and protectionism, and a weakened sailing fleet that was no longer able to protect Dutch interests. Like fleas jumping from a dead dog, the Sanhedrin now moved their major operations from Amsterdam to London and the English East India Company replaced the Dutch East India Company as a force to be reckoned with. England has had a Constitutional monarchy ever since. The devastation of the Protestant Dutch left for dead. Never more would Catholicism hold sway in England; hence, the reason why Judeo-Protestants call this "The Glorious Revolution". It would also mark the beginning of the NT Jews always being in control of England's affairs; hence the reason why the media-Scribes call it "The Glorious Revolution". Forwarding to the American Revolution of 1776, my instincts tell me that the colonies were trying to distance themselves from the growing grip of the Pharisees in post 1688 Glorious Revolution England. Catholics no longer had representation in England and neither did the American colonists who were to help fund England's upcoming Judeo-empire.